A kind of sweet biscuits with a strong egg flavour. There are two main kinds of egg roll in HK. 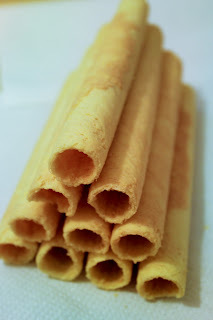 Those you find in supermarket, they are usually butter egg roll with a strong butter taste. While those you find in some small old shops on the street or in some tourist spots, they are more tasty as they have less butter and most importantly, they are HANDMADE. So the egg flavour is stronger and the feeling is lighter. You can grab a pack with about 10 rolls in those small shops for about 20hkd while in supermarket, you can grab a tin box of about 50 rolls for 50hkd.